This elegant 9ct white gold ring features a deep blue sapphire surrounded by a cluster of delicately dazzling diamonds. 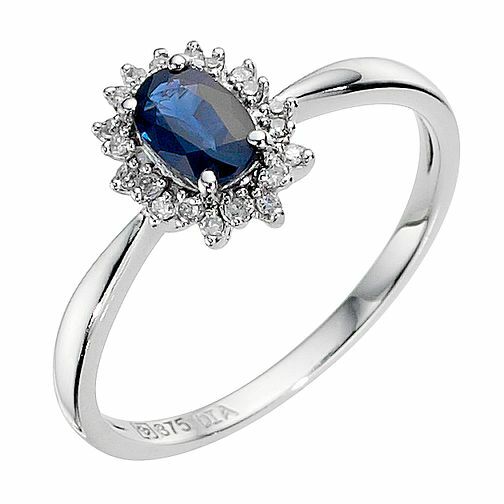 Sapphire is the birthstone for September, making this the perfect gift for a woman born in that month. 9ct white gold sapphire and diamond cluster ring is rated 5.0 out of 5 by 8. Rated 5 out of 5 by Anonymous from Stunning ring This ring is beautiful the sapphire is a deep blue and the diamonds surrounding it sets the ring off and it really shines in a classy way looks expensive and elegant. Would definitely recommend.